There is often discussion in the USA about eliminating the penny, the one-cent coin, from our currency. This is also known as the penny debate. I like pennies because I prefer to pay in exact change for my cash transactions but there are good reasons for retiring the little penny, such as the high cost of producing the coin (2.4 cents per coin) or its lack of acceptance in vending machines or toll booths. Nevertheless the penny is here for the time being (for now). Carrying around many coins in your pocket or purse can be a nuisance sometimes and pennies accumulate faster than quarters (in my case at least). I mention this because of a practice in the U.S. called give a penny, take a penny or the penny tray which refers to a type of tray or dish often found in small stores or restaurants in North America, meant for convenience in cash transactions. This small cup or dish is located near the cash register for people to place pennies they receive as change if they do not want them. 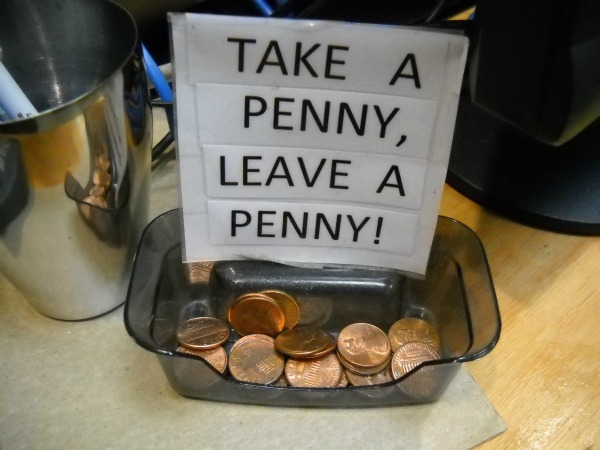 Then, customers who, for example, need one cent for a transaction can take one of the pennies to avoid needing one of their own or breaking a higher-denomination coin or bill. The penny tray isn't there as free money. You can't simply take a penny because you want one; take a penny when you need one. It's a friendly honor system. So since we haven't retired the penny coin, we can't possibly retire the penny tray (yet).